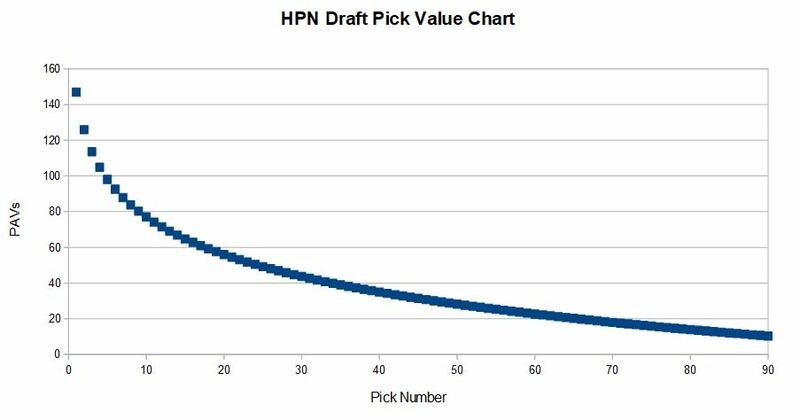 In 2014 HPN released the first iteration of our Draft Pick Value Chart – a cornerstone of much of our work in this space despite being on Tumblr. A year later in 2015 we explained our theories around valuing trades, draft picks and players in a little more depth – it’s a long read, but we hope still a good one. Some of our concepts have moved on since then however. Then in 2016, we made a significant revision to our Draft Pick Value Chart – including a “quality” weighting. Since the introduction of PAV, we radically overhauled the Draft Pick Value Chart – v3.0 for those keeping track at home. It is the one you see above. We think it is the most accurate value chart yet. The HPN Draft Pick Value Chart v3.0 takes into account draft information – provided by Draftguru – covering the 1993 to 2006 drafts, excluding father-son picks taken in that period. The value of each pick is a logarithmic regression of the PAV value of each pick across this sample. The regression equation was with an R2 value of 0.73. This is not the official AFL Draft Value Index – which is derived from salaries and not on-field output. We are not saying that the HPN DPVC is better or worse than the AFL one – just different. In order for us to value trades, we have to use a common measure of currency – which is why we created the HPN DPVC. 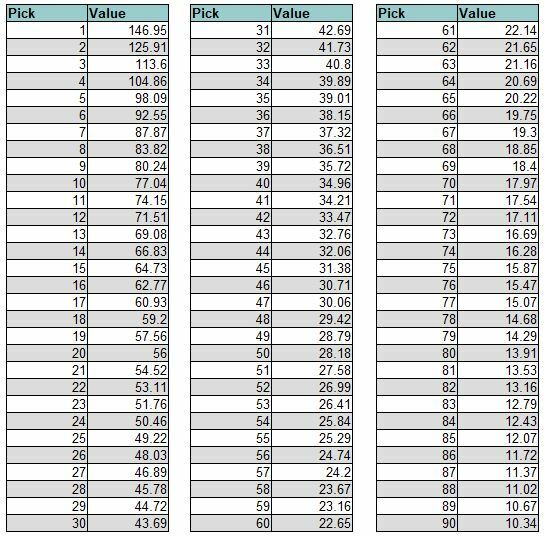 For a great AFL Draft Pick Value Index Calculator, check out this one from DraftGuru.